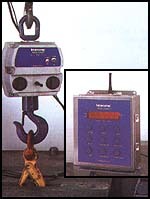 High Accuracy, compact digital hanging scale for all low capacity weighing needs. 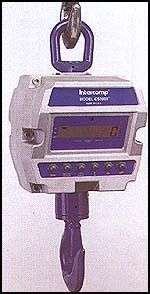 Intercomp's advanced design makes this remarkable crane scale the first choice over other electronic units. It's value packed with the industry's most wanted features. Our ultra-high resolution, 20-bit A/D converter provides highest accuracy available - (+/-) 0.1% of applied load. 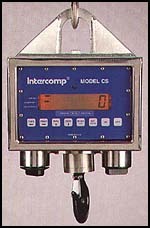 Intercomp's advanced design makes this remarkable crane scale the first choice over other electronic units. It's value packed with the industry's most wanted features. Our ultrahigh resolution, 20-bit A/D converter provides the highest accuracy available - (+/-)0.1% of applied load. Has leading edge radio telemetry for fast weight readouts at remote locations (operating range up to 1,000 feet). Transceiver is FCC-approved. 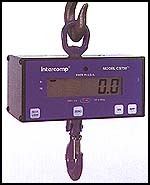 Intercomp's advanced design makes this remarkable crane scale first choice over other electronic units. It's value packed with the industry's most wanted features. Our ultrahigh resolution, 20-bit, A/D converter, plus 16-bit microcontroller, provides highest accuracy available - (+/-) 0.1% of applied load.